Nakauriite: Mineral information, data and localities. May contain minor Mg, Ni. 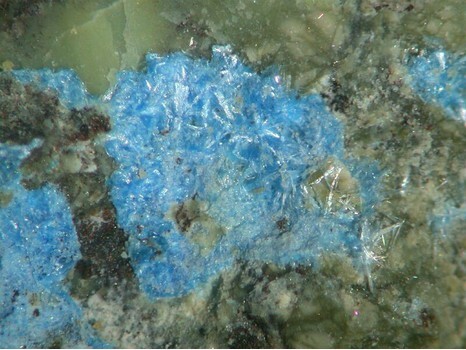 The originally reported sulphate content appears to be questionable according to several literature sources; the crystal structure is unknown. Palenzona & Martinelli (2007) suggest a formula (Mg,Cu)x(CO3)y(OH)z•nH2O (x, y, z unknown). Serpentine Subgroup 3 photos of Nakauriite associated with Serpentine Subgroup on mindat.org. Tremolite 3 photos of Nakauriite associated with Tremolite on mindat.org. Talc 3 photos of Nakauriite associated with Talc on mindat.org. Hydromagnesite 1 photo of Nakauriite associated with Hydromagnesite on mindat.org. Huntite 1 photo of Nakauriite associated with Huntite on mindat.org. Aragonite 1 photo of Nakauriite associated with Aragonite on mindat.org. 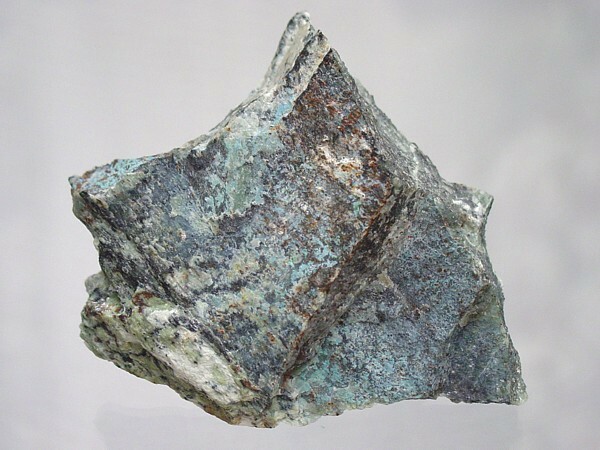 Suzuki, J., Ito, M., Sugiura, T. (1976): A new copper sulfate-carbonate hydroxide hydrate mineral, (Mn,Ni,Cu)8(SO4)4(CO3)(OH)6·48H2O, from Nakauri, Aichi Prefecture, Japan. J. Mineral. Petrol. Econ. Geol., 71, 183-192. American Mineralogist (1982): 67: 167. R. S. W. Braithwaite & R. Pritchard (1983): Nakauriite from Unst, Shetland. Mineralogical Magazine, 47, 84-85. Palenzona, A. & Martinelli, A. (2007): La nakauriite del Monte Ramazzo, Genova. Rivista Mineralogica Italiana, 31(1), 48-51. Habel, B. 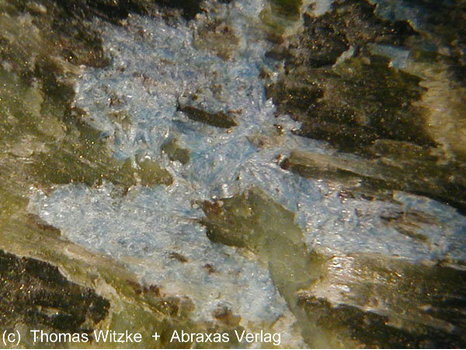 (2006): Die Mineralien der Kupferschlacken der Grube „Virneberg“ bei Rheinbreitbach, Rhein. Mineralien-Welt, 17, (1), 38-49; Heinrich, M., Reinhardt, M. (2017): Virneberg, Rheinbreibach, Siebengebirge, Germania. I minerali delle scorie. Micro, 15, 2-2017, 104-107. Palenzona, A., & Martinelli, A. (2007). La nakauriite del Monte Ramazzo, Genova. Rivista Mineralogica Italiana, 31 (1), 48-51. Kosuge, Y. et al (1997) 10, #1, 6-9. Braithwaite, R.S.W. & Pritchard, R. (1983) Nakauriite from Unst, Shetland. Mineralogical Magazine, vol. 47, n° 342, p. 84–85.